Review the CME information and faculty biographies/disclosure tab. Register for the CME activity. Select the "PRESENTATIONS/ASSESSMENT" tab to view the presentations (***Tab will become available once you are registered***). Print/download your personalized CME certificate. If you need to review the course materials at later date, click the "already registered" link found under the registration button, and login with your email address and confirmation number found in your confirmation email. This in-depth human trafficking session highlights the victims, exposes the global and domestic social-environmental conditions that allow for it, shares research, and offers strategies to combat it. Explain how providers can recognize human trafficking as it presents and how medical institutions are actively working to identify, treat, create referral pathways, and collaborate for treatment. List psychotherapies that may be beneficial in the human trafficking population. 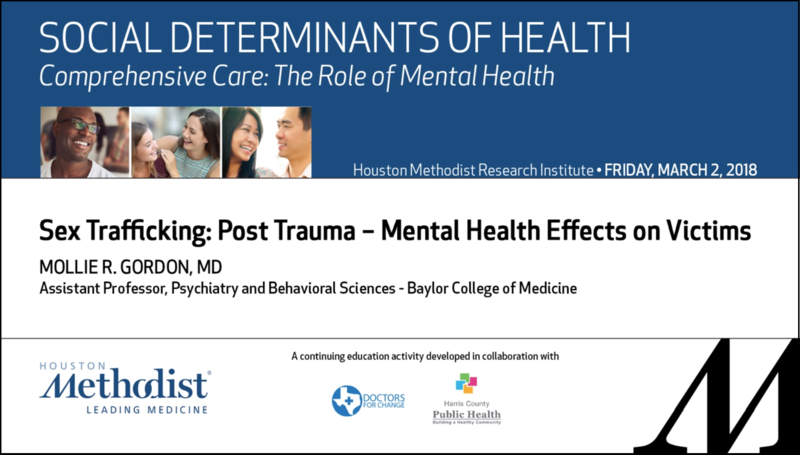 Physicians, nurses, case managers, social workers, allied health care professionals and others involved or with an interest in social determinants of health. Houston Methodist is accredited by the Accreditation Council for Continuing Medical Education (ACCME) to provide continuing medical education for physicians. Houston Methodist designates this enduring material for a maximum of 1 AMA PRA Category 1 CreditTM. Physicians should claim only the credit commensurate with the extent of their participation in the activity.